Two weeks ago, like Jewish people around the world, I went to my local synagogue on Yom Kippur for Kol Nidre prayers. 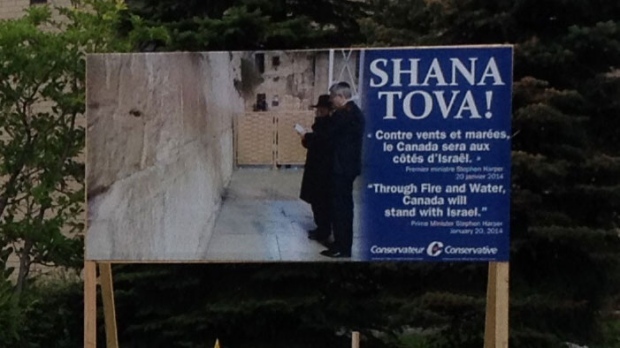 I saw a giant “Shana Tova” campaign poster just outside my shul in Westmount proclaiming the Conservatives as the only party that will stand by Israel “through fire and water”. It wasn’t just our shul. People across the country reported seeing these campaign posters put up outside their synagogues just in time for the High Holidays. Our rabbi was angry. So were a number of members of the community. So was I. As we stood in the lobby waiting for Kol Nidre services to start, the discussions in hushed whispers were adamant among the (largely Liberal-leaning) members of the congregation. After all, it’s one thing for political candidates to send a new year’s greeting. That’s nice, and more or less expected. It’s quite another for them to campaign, without permission I might add, opportunistically on a religious holiday, slamming opposition parties in the process. Of all the things that offend me about the Conservatives — and there are many — the blatant way that Stephen Harper has tried to paint himself as the pro-Israel candidate to win Jewish votes might be the worst. The sheer chutzpah that it takes for a party opposed to the most basic Jewish values — knowledge and debate, respect, derech eretz, tikun olam — and the way that it’s been done — through lies, wedge politics, scapegoating of the “other”, manipulation and lies to many (often elderly) voters — offends me on a viscerally personal level. Many of our parents and grandparents remember “None Is Too Many” all too well, when the Mackenzie-King government shut Canada’s doors to Jewish refugees desperate to escape Europe before World War II. Stephen Harper’s government has made similar declarations about refugees desperately fleeing Syria. The Harper government even went so far as to take away basic healthcare for refugees. The Jewish community has been a victim of scapegoating and wedge politics far, far too many times in our history. The way that Stephen Harper has used the niqab issue to play wedge politics with Muslims is something that we should all take personally. Judaism values knowledge and learning. Stephen Harper has declared a war on science and data, crippled Statistics Canada, and has burned books and records. Tzedakah and helping those less fortunate is a basic Jewish principle. 50,000 Canadian Jews live below the poverty line. The Tories’ policies to combat poverty involve tax cuts for the rich and for oil companies, while cutting EI benefits and social assistance. Protecting the environment is a Jewish value. This one ought to be self-explanatory, but in case it’s not, here’s a rundown of the Tories’ record on this front. The new Conservative law allowing the government to strip the citizenship of anyone convicted of treason, terrorism or other crimes provided they have — or are eligible for — citizenship of another country should be of concern to Jews, since the Law of Return specifies that we’re all technically eligible for Israeli citizenship. And, given how vaguely the law defines the circumstances under which citizenship can be stripped — in theory, anything “anti-government” could qualify — this effectively turns us all into second class citizens. The above is just the tip of the iceberg. Suffice to say that the Conservatives have proven that they are the antitheses of Jewish values on most issues of concern to Canadians. There are more than enough reasons on the home front for Jewish voters to reject the Tories and vote for someone — anyone — else. But what about the original claim? Chutzpah or not, is Stephen Harper right that his government is the only one that staunchly supports Israel? It seems that Harper’s support for Israel “through fire and water” may not be much more than hot air. This may explain why the Israeli media coverage of Harper’s speech at the Knesset was almost non-existent. It seems that while Harper makes a big deal about his government’s support for Israel, the deal is not very big after all. In contrast, the Liberal party has a long and committed history of staunchly supporting Israel. Former MP Irwin Cotler in Mount Royal was a stalwart supporter of human rights and spokesperson in Parliament for Israel. The ugliness of the campaign in Mont-Royal shows how the Tories will use every dirty trick in the book to try to win the staunchly Liberal riding. But current polls suggest that they’re failing to do so. People know and recognize the Liberals’ commitment to Israel, and aren’t going to be fooled by Tory lies. The NDP’s record on the topic is less clear. The party has a history of running fringe candidates with anti-Israel leanings, like Libby Davies or Svend Robinson. and of integrating viewpoints from Israel’s enemies. But, as the party has moved closer to the centre under Thomas Mulcair has been making strides to clean up its act. Mulcair himself is a staunch supporter of Israel, married to a French Jewish woman with relatives in Israel. And he’s ejected anti-Israel candidates from his party and clarified the party’s position in support of Israel — albeit within the context of UN resolutions that have very little in the way of credibility. While I can understand that supporters of Israel may have significantly more trepidation about voting NDP, they have been moving in the right direction. The Canadian Jewish News ran Q&As with both leaders. You can find them here for Justin Trudeau and Thomas Mulcair. I’m not religious but I have a strong and committed Jewish identity. I’m a staunch supporter of Eretz Israel. These are basic truths to me, not cards in the deck of politicos looking to score cheap points. Count me among the Canadian Jews who are pushing back. We do not want your brand of “support”, Mr. Harper. And you’ll pay for it how, exactly?